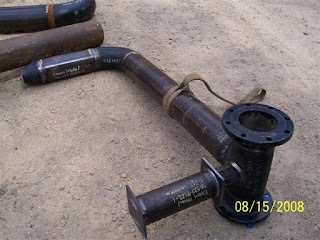 I have a question relative to ASME B31.3 the code for chemical plant piping. has been qualified in that WPS? have questions about, I thought it wise to seek your council. I truly appreciate any enlightenment you can provide. Answer: The section you are referring to (328.2.2) is specific to the use of weld procedures qualified by others (not qualified by you). When a fabricator wishes to utilize these procedures, they face many limitations. One of those, as you’ve discovered, is the process used. There are many other allowable processes available but all would require you to produce a qualified Weld Procedure Specification (WPS). 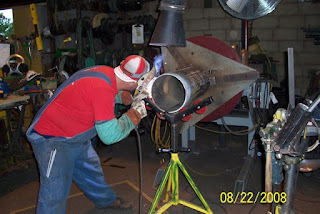 ASME B31.3 section 328.2.1 mentions, “Qualification of the welding procedures to be used… shall conform to the requirements of… Section IX…” So ASME Section IX will layout your requirements for qualification. The process that you are wishing to use, Gas Metal Arc Welding (GMAW), is included in Section IX as an allowable process. So, yes, you can use the GMAW process but you will need to qualify a WPS to do so. As for your Welder being qualified to the new WPS, that is a bit of a “Chicken or the Egg” scenario. d to a WPS before the WPS has been tested and developed and a WPS won’t be qualified until a competent welder completes it. Code writers recognize this. ASME notes that a procedure qualification has a distinctly different purpose than a welder qualification. As for Welder Qualification, QW-100.2 notes that, “the basic criterion established for welder qualification is to determine the welder’s ability to deposit sound weld metal”. So how does this apply to Campbell Fittings and their desire to utilize the GMAW process? It sounds like you need to qualify the GMAW process. This can be done by any of your competent Welders. Once your Welder has successfully completed the Process Qualification testing he/she will be considered qualified. The limiting factor will be that the process will be qualified within a given range of essential variables and the performance (welder qualification) will be qualified within a different given range of essential variables. Once the WPS is completed the welder who qualified it may need additional testing to utilize it in your specific application. Example: Your Welder completed the Procedure Qualification test (PQR) in the Vertical (3G) position, on a Single V-Groove, with a backing strip and the progression was up. You would like to apply this same Procedure Qualification Report (PQR) to a similar joint but you intend to change the groove by eliminating the backing and weld vertical down. A new WPS could be written to reflect these changes and would not require testing, but your Welder would not be qualified to this new WPS. Confusing? I know. When talking “Code Talk” always make sure you separate Procedure Qualification from Performance Qualification. I often see where these two consistently trip people up when talking weld qualifications. Consider contacting a competent Certified Welding Inspector who understands the ASME Codes to review your specific needs and advise you on additional testing requirements.